The exercise, which took a full year, revealed some new features, including new mountains (none higher than 2,290 feet (700 meters)) and depressions in equatorial regions that appear to be either ancient, dried seas or cryovolcanic flows (that is, flows produced by ice volcanoes). The Cornell scientists also learned that Titan is more oblate—or flatter—than we thought, which means it has a crust that’s highly variable. “We’re measuring the elevation of a liquid surface on another body [930 million miles] away from the sun to an accuracy of roughly 40 centimeters [15.75 inches]. Because we have such amazing accuracy we were able to see that between these two seas the elevation varied smoothly about 11 meters [36 feet], relative to the center of mass of Titan, consistent with the expected change in the gravitational potential,” said Hayes in a statement. 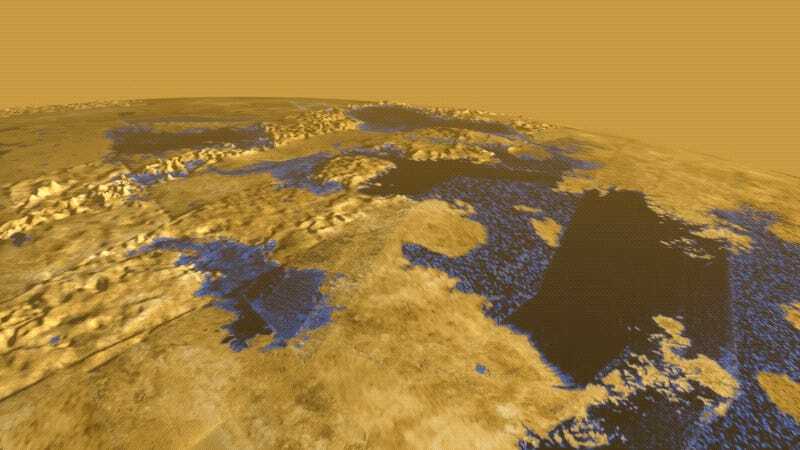 Much of this is pure speculation at this point; scientists will somehow have to prove that Titan’s subsurface features pools of interconnected reservoirs of hydrocarbons—a big ask, to say the least. But that simply means Titan is ripe for further investigation, and possibly a robotic mission.